Enjoy the beauty of your favorite seasons year-round with Stephen Kitras' hand-blown glass sculptures. 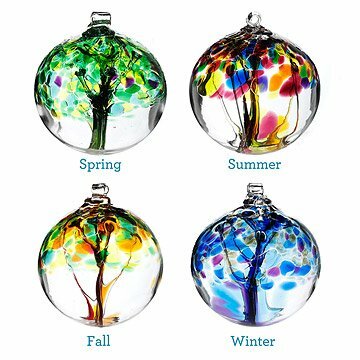 Enjoy all the seasons year round with the unique Tree of Enchantment decorative recycled glass globes from Canadian artist Stephen Kitras. The gorgeous hand blown glass orb features an interior glass "trunk," which branches to support the translucent colors of the tree's leaves. Choose between spring's fresh greens, the vibrant shades of summer, the crisp oranges of autumn and winter's cool blues, or hang all four orbs in a sunny window for a dazzling display of the seasons' cycle of life. Use your own sturdy wire, translucent fishing wire, or ribbon to hang the globe from the display stand or elsewhere. Handmade in Ontario. Click here to see spring, summer, fall, winter. My SIL has several of these globes in different sizes hanging in her windows. I thought they were out of my budget until I found them at uncommon goods. I know have two and want more! The sun shining through these globes is beautiful! Very nice well made products. My wife wanted to start collecting witches balls. After looking through many websites I found this gem. So many options with great prices and well made products. Daughter has beautiful apartment with abundance of natural light due to big windows. New display shelves needed a pop of color at top. Beautiful design with the colors matching the photo. It came very quickly and they wrapped and protected the glass ball well enough that it would have survived the Apocolypse and falling out of a 20 floor building, lol. I will be purchasing more items! This will look great in a living room or on a window sill where the light can really hit it. It's bigger than I expected. Just need to think about something to hang it from to display it! My daughter requested this for a Christmas gift. It was so easy to order and received in time to give it to her for Christmas. This was a wedding gift to remind the couple to celebrate their love every day. I love that the glass globe is something they will see every day to bring them joy and see the beauty in the world! One is not enough. You need them all! Pure pleasure is the only purpose. I check on them several times a day in different light. I love to hang these colorful globes in the tree in my backyard. I love the way they catch the light in the late afternoon and Fall is my favorite season! Very nice and bright globes that make my lady happy.